Type: Terrestrial island; located off the coast of Manchuria. (Marvel Two-in-One#25 (fb) - BTS) - The island of Kaiwann had long been split between two countries, which had warred for centuries. In recent days, the Gracious One (emperor of one country) contracted to marry Queen Sen (ruler of the other) and end the wars. Queen Sen's highest military officer, General Chonga, was unable to accept this, and kidnapped Queen Sen to ensure that the wars could continue. He took virtually the entirety of the Queen's military with him. (Marvel Two-in-One#25 (fb) - BTS) - Representatives of Queen Sen made attempts to recruit New York City heroes to "train their forces" or supply them with weapons; those contacted included the Thing and Iron Fist, but they both turned them down, as did apparently everyone else they contacted. After a few weeks passed, they subsequently kidnapped Iron Fist and confined him in a jet aircraft mounted below a Goodyear dirigible. (Marvel Two-in-One#25) - Those same representatives also blasted the Thing while he attended a NY Jets football game and winched him into the jet/dirigible. When he awoke, he and Iron Fist escaped confinement but the pair realized that they were trapped in the aircraft and over the ocean. A few minutes later, the aircraft reached Kaiwann space and the pair was unceremoniously dumped in the jungle; they were told to battle their forces with the theory apparently being that if the Kaiwannese troops could beat Iron Fist and Thing, they could beat Chonga. As Dragon expected, the pair easily beat the three men sent after them, and one, Konga, pointed them at the Temple at the Ridge of Four Hells. 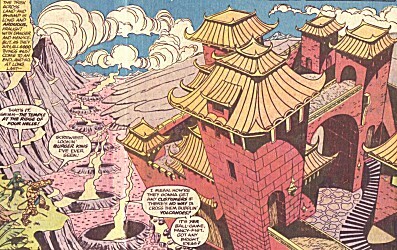 (Marvel Two-in-One#25) - From the Temple at the Ridge of Four Hells, the Gracious One and Prince Dragon observed the defeat of Sen's warriors. When the Thing and Iron Fist arrived, Prince Dragon led Mongo and S'kari to confront them; he then revealed that he had needed to bring the heroes there without Chonga's awareness; Dragon revealed Chonga's treachery and recruited the two against Chonga. Base-jumping into Chonga's underground headquarters, Dragon, S'kari, Mongo, Iron Fist, and the Thing defeated Chonga and his forces and rescued the Princess. She was returned to the Temple, to undergo her marriage to the Gracious One. Comments: Created by Marv Wolfman (writer/editor), Ron Wilson (pencils), Sam Grainger (inks). In addition to the active volcano located across from the Temple at the Ridge of Four Hells, the island nation of Kaiwann contains a variety of terrains including large swamps, jagged mountains, and dense forests. Kaiwann is located off of Manchuria, which is north-eastern China and/or south-eastern Russia, depending on your definition. This probably puts Kaiwann in the Sea of Japan or the Sea of Okhotsk, possibly in a political situation where it has been claimed by multiple powers (Russia, Japan, China) and so never fully been taken over by any and thus allowed to maintain its independence. Kaiwann (or at least its leaders) possessed surprisingly high-tech equipment for the time, including computer video surveillance and communications equipment with enormous displays, and a hoverjet capable of traveling from New York City to Kaiwann in a matter of a very few minutes. By the by - no, neither of the rival nations were given a name in this issue. When the two leaders of Kaiwann's warring nations arranged a peace treaty, General Chonga led most of his nation's military forces to kidnap his nation's leader (Queen Sen) to ensure the war would continue; he set up headquarters in a deep set of underground tunnels. However, Queen Sen's loyalists brought in the American superheroes Iron Fist and the Thing to help rescue her, and the Thing easily knocked Chonga unconscious and rescued Sen. Chonga was an expert warrior, and wielded a "death ax" that he named as "O Kama Yari." Prince Dragon was betrothed to Queen Sen, leader of one of the two warring nations on Kaiwann. His betrothal to Sen ended when she dutifully agreed to marry the Gracious One, emperor of their rival nation. When Sen was captured by a rogue general, Dragon worked with the Gracious One to secure her freedom (bringing in American superheroes to do so), and despite his and Sen's shared love, he stepped aside so she could marry the Gracious one for the good of their country. Prince Dragon was a trained warrior, and wore a ceremonial dragon mask in combat. The Gracious One is the elderly Emperor of one of the two nations on Kaiwann, and it was his demand that Queen Sen marry him to cement their nations' peace accords. When Sen was kidnapped, he worked with Prince Dragon to arrange her retrieval. 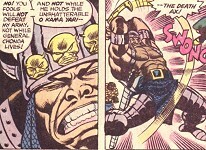 Konga was a Kaiwannese warrior, one of several who traveled to New York and kidnapped the Thing and Iron Fist. Soon after, he was one of three sent to battle the Thing and Iron Fist as part of a ruse to get them to the Temple at the Ridge of Four Hells where Prince Dragon could meet them without Chonga's observation. The pair easily defeated Konga and his compatriots, and Konga told them where to find the Temple. Konga is a trained swordsman. Mongo and S'kari were two of the very few troops to remain loyal to Queen Sen after General Chonga's treachery. They were part of the team which traveled to New York and kidnapped Iron Fist and the Thing, and they subsequently briefly fought Iron Fist and the Thing at the Temple, but then accompanied them in base-jumping into Chonga's underground headquarters to rescue Sen. Both are trained warriors; Mongo is an expert with the mace as well as with a small pair of curved daggers, and S'kari is an expert with the sword. S'kari is blind, but still a master warrior. Queen Sen was the ruler of one of the two nations on Kaiwann; she was betrothed to marry Prince Dragon. However, when the Gracious One (emperor of their rival nation) asked her hand in marriage as part of a peace treaty, Queen Sen agreed, seeing it as her royal duty. She was kidnapped by her rogue general Chonga (who wanted to keep the war going), but rescued by Prince Dragon, Iron Fist, the Thing, and a small handful of loyal soldiers. After a grateful kiss for Prince Dragon, she returned to her place at the Gracious One's side. The Temple at the Ridge of Four Hells is an apparent ceremonial center of government for Kaiwann. It is an ancient temple located on a ridge facing an active (if quiet) lava-producing volcano.